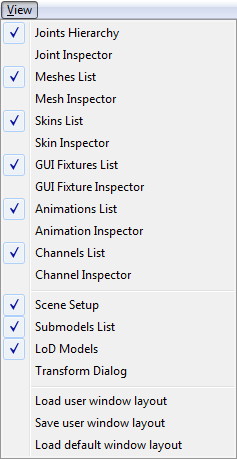 This section lists the menu and toolbar items that are available in the Model Editor. New and Open: In the Model Editor, as new models cannot be created from scratch, these two buttons serve the same purpose: They open the dialog for loading or importing model files. Save: Saves the model under the current name. Save As…: Saves the model under a new name. 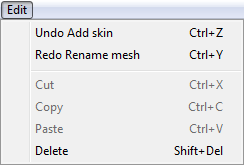 Undo: Un-does the previously made change to the model. Redo: Re-does a previously undone change. Cut, Copy and Paste: These three are not yet implemented in the Model Editor. Delete: If the currently selected model element can be deleted, this button deletes it. Animation playback: play or pause the currently selected animation sequence, or switch to the previous or next available sequence in the animations list. Transform model: Opens the Transform Model dialog. Add GUI fixture: Adds a new GUI fixture to the model. New: Opens the dialog for creating a new map or new GUI, or for importing a model. Open…: Opens the dialog for loading or importing a map, a GUI or a model. Close: Closes the currently active file. Save: Saves the file under the same name. Save As…: Saves the file under a new name. 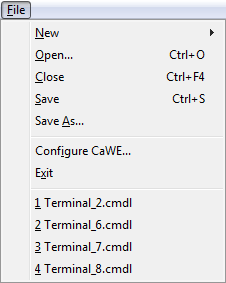 Configure CaWE…: Opens the Configure CaWE dialog. Exit: Checks if all modified files have been saved and quits the application. Recently opened files: This part of the menu lists the most recently opened files. Select one to open it. The View menu items open and close the dialogs and panes of the Model Editor: Check an item to show the related pane, and un-check the item to hide it again. This is especially useful if you've accidentally closed a pane that you want to bring up again. 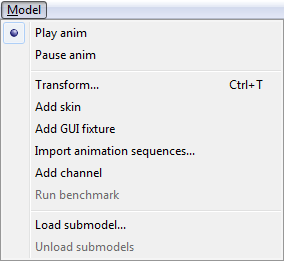 Play anim and Pause anim: Like the related toolbar buttons, play and pause the currently selected animation sequence. Transform…: Opens the Model Transform dialog. Add… or Import…: These items are the menu equivalents to the “+” buttons in the model element lists: The add or import a new model element of the specified type. Run benchmark: This is not yet implemented. Load submodel… and Unload submodel: Loads and unloads submodels, just like the “+” and “-” buttons of the Submodels dialog. As in all of the Map, GUI and Model Editors, the Window menu can be used to arrange and change to the currently opened windows. As in all of the Map, GUI and Model Editors, the Help menu opens the web browser with related websites for help and support, and shows the CaWE About dialog.